After what seemed like an eternity, at last water has started flowing towards Chennai. The scriptures say that Bhagiratha, an ancient Indian sage, prayed for hundreds of years to bring Ganges down from Heaven to Earth. With God Incarnate, things are different. When man is in distress, He rushes to his aid without waiting for prayers. And that is precisely what has happened in the case of the Chennai Water Project. Since Baba’s Trust had already executed various water projects in Andra Pradesh [AP] bringing drinking water to over two million people, the Chief Minister of AP was ready and eager to co-operate with Baba and do all that was necessary so that Baba’s promise to Chennai became a reality. 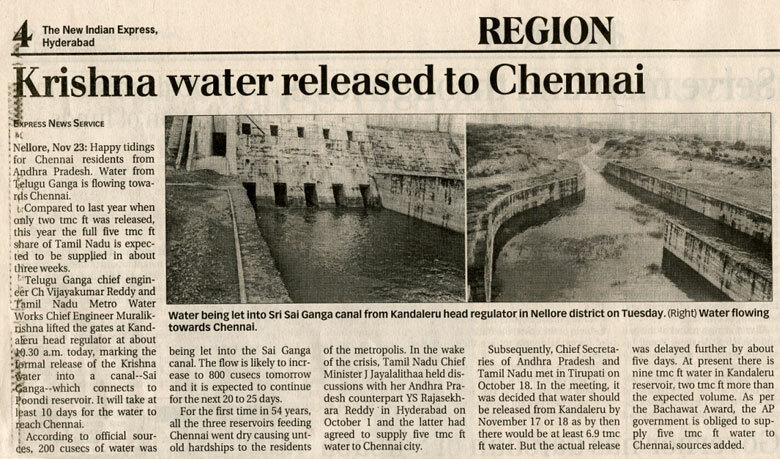 After technical examination, it was found that water flow to Chennai was minimal because the original Telugu Ganga Canal linking Kandaleru [in AP] to Poondi [in Tamil Nadu] had become dilapidated. So, it was decided to literally rebuild the canal all the way [about 150 km] and Baba’s Trust took upon itself the responsibility of funding the entire project. In practice this meant a) making improvements to the reservoir in Kandaleru so that it could hold enough water to serve even during dry seasons, b) deepening and widening the canal as required, and c) lining the canal with the latest technology to totally eliminate seepage. Actually, the Project itself was completed in thirteen months flat from the time work commenced. However, for reasons we would never know, Swami as the Controller of Destiny delayed the arrival of the Rain Gods. 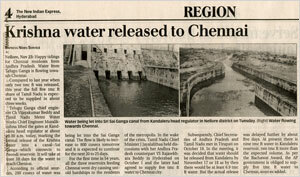 Finally, by early November 2004, there was enough water for discharge to Chennai. And the shutters were opened on 23rd November 2004, - that was Swami’s Prasadam to the people of Chennai on the occasion of His 79th Birthday! After discharge, water took six days to reach the zero point [just before the Poondi reservoir]. The date was 29th November. The day was Monday and according to the Telugu Calendar, this was actually Swami’s Birthday. So the discharge started on the Birthday according to one calendar, and water reached the zero point on the Birthday according to another calendar! A few days after the release of water, a few devotees from Chennai came to express gratitude to Swami. Swami went straight to them and asked eagerly like a mother, “Did the water reach Chennai?” The devotees replied in the affirmative and thanked Swami profusely. Swami face radiated the joy and satisfaction of a thousand mothers.